An increasing number of scammers are using landline phone calls to con people out of money, after a crackdown on bogus emails and mobile phone texts. HM Revenue and Customs said it received 60,000 reports of phone scams in the six months to January 2019 – up 360% compared with the previous six months. It said conmen pose as tax officials, threatening legal action or jail. Treasury minister Mel Stride said anyone who was suspicious about a call should hang up and report it. HMRC, the authority in charge of taxes in the UK, said criminals were turning to more traditional scams such as cold calling publicly available phone numbers such as landlines. It said it had worked with Ofcom to shut down nearly 450 lines being used by scammers in the past year. Nearly 26 million homes have a landline phone, according to Ofcom, meaning they could be at risk from these type of scams. Mr Stride, financial secretary to the Treasury, said the crackdown on text and email phishing scams had left fraudsters with “no choice but to try and con taxpayers over the phone”. “If you receive a suspicious call to your landline from someone purporting to be from HMRC which threatens legal action, to put you in jail, or payment using vouchers: hang-up and report it to HMRC who can work to take them off the network,” he said. And HMRC said it would only ever call and ask for a payment for a debt that the person was already aware of – for example by previously having received a letter – or if the person had told it they owed some tax or submitted a self-assessment return. Pauline Smith is head of the Action Fraud service, where people in England, Wales and Northern Ireland can report fraud and cybercrime. Scammers often target older and more vulnerable people. 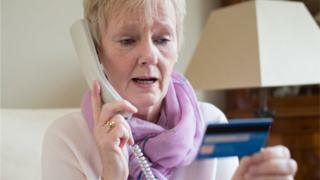 Caroline Abrahams, the director of charity Age UK, urged people to be cautious when receiving cold calls from someone requesting money, “no matter where they say they’re calling from”. “If there are any niggling doubts it is always sensible to end the call and contact the company or government department separately using a phone number taken from a piece of official correspondence or their website,” she said.